YuppTV Studios, YuppTV's flagship Original Content Sector announced the launch of another fascinating Web Series 'B.Tech' on November 15th. The Series is produced by YuppTV in association with Zee5. It is available on YuppTV platform in all the countries outside of India. The story of 'B.Tech' is written by Tharun Bhasker, the award-winning director who had provided stories for films like Pelli Choopulu, Ee Nagaraniki Emaindi, etc. The series casts young actors like Meraj Ahmed, Upendra Varma, Kaushik Ghantasala, Abhay Bethiganti, Madhulatha Reddy, Tanvi Desai etc. The trailer of the Web Series was released on 13th November on all the social media platforms. B. Tech narrates the story of three young B.Tech students Vikram, Akhtar, and Hari, with highly different dreams from their student counterparts. The series reveals their dreams and the struggles they go through to achieve their dreams. The series cover all the emotional highs and lows of the three lives, with some nail-biting sequences and refreshing comedy. 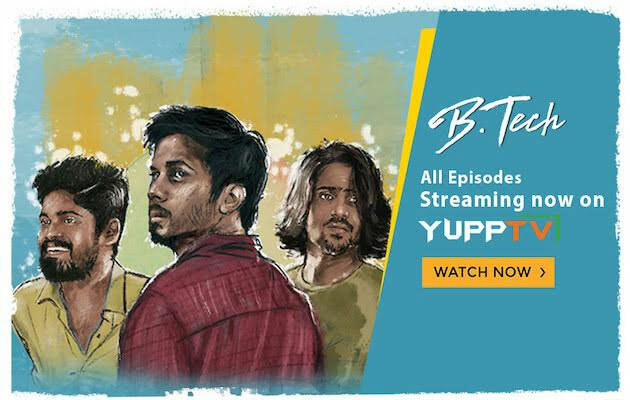 Like all YuppTV's previous originals, B.Tech spans over 9 episodes with spectacular performances, intriguing dialogues and heart touching sequences. Interested viewers can binge-watch all episodes on YuppTV. "NTR Biopic Overseas Release by US Telugu"